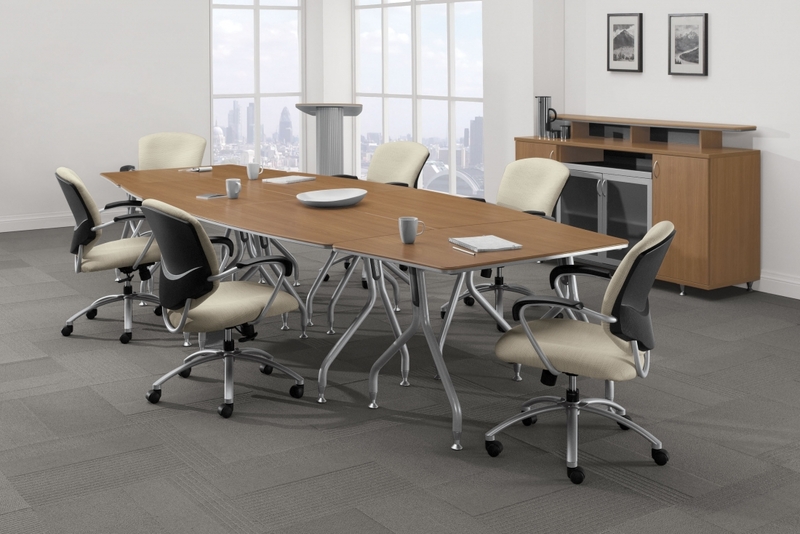 The Bungee table collection from Global Total Office has been an industry favorite for more than 5 years. This innovative line of connectable tables provides exceptional modular benefits while simultaneously improving collaboration. Today on 'Office All Stars' we'll take an in-depth look at the Bungee line and the features that make its table a great option for your business interiors. First and foremost, we need to talk about quality. All Global products are made to order. This means, you're not purchasing components for office interiors that have been sitting on a shelf for years. Global Bungee tables are made specifically for you in a surface, size, and base finish option of your choosing. They're very sturdy, durable, and ready for the demands of the modern workplace. 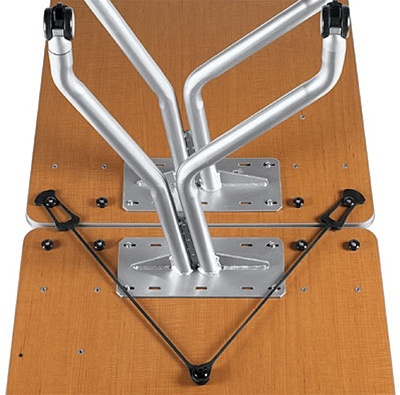 Bungee tables are available in both fixed leg and mobile variations. We highly recommend the mobilized tables from this collection as they'll provide your business with exceptional versatility. The ability to quickly move tables in groupings and configure them as needed will save you time while simultaneously improving operational efficiency. The tables from the Global Bungee collection are sold individually, or as apart of modular packages that really rock. 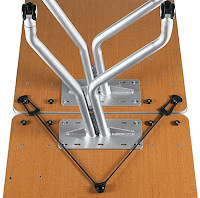 Popular Bungee table sets like the BXK132S include all of the components necessary to provide your business with the ability to quickly transition between both conference and training applications. If you're business is limited on available workspace, Bungee has you back! Are you having a hard time getting the most out of your professional interiors? If so, Bungee tables are a must consider. 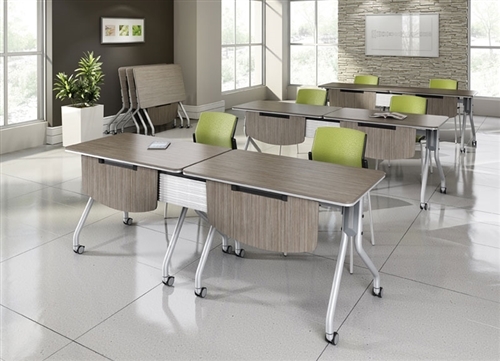 The quick connect training room tables with wheels from this collection will make it easy to encourage group creativity, privacy during testing sessions, and so much more. With Bungee, it's all about thinking outside the box. 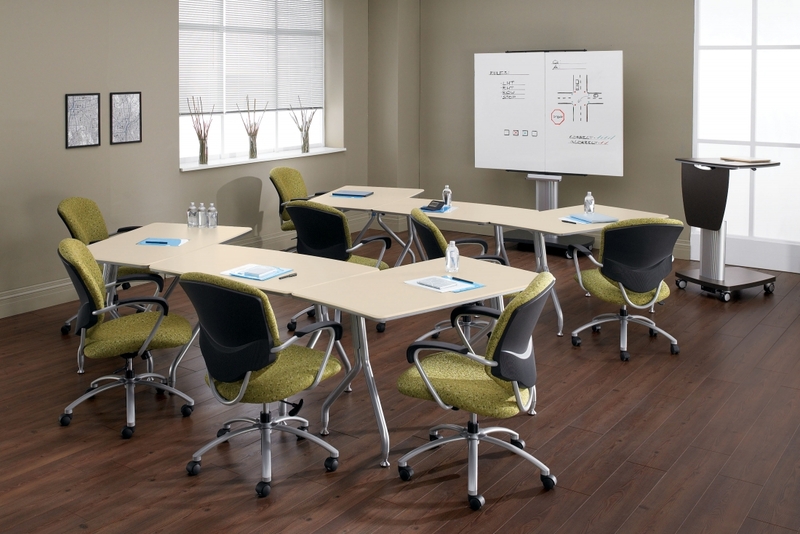 From the conference room to the classroom, Bungee tables reign supreme. In a world filled with cheap knock offs and imitations that aren't built to last, this popular collection has truly stood the test of time. Bungee tables are do-it-all workhorses around the office. The ability to quickly connect and separate to accommodate groups of any size puts this best selling line in a league of its own. Over the years we've had the opportunity to check out this All-Star collection several times. We simply can't say enough good things about it. With multiple sizes, shapes, and finish combinations, you can really put a personal stamp on your interiors without sacrificing functionality. We give this modular office table collection from Global a well deserved 5 out of 5 star rating. They're truly amongst the best and most user friendly tables available on the market.